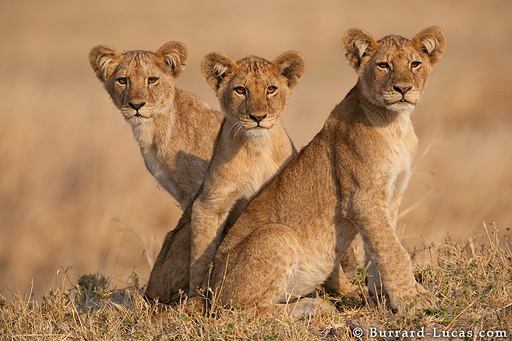 These three lion cubs were about three months old and had been left alone while the rest of the pride went hunting. They were resting on a mound overlooking the Katisunga floodplain in Katavi National Park. We positioned ourselves with the sun behind us and watched them for a while. All of a sudden the cubs sat up and stared intently into the distance. They had spotted a large male lion walking across the plains. As the male moved behind us, the cubs lined up in this perfect formation... we couldn't have asked for a better pose!